Find hotel near Sound And Light Show - Ph .. 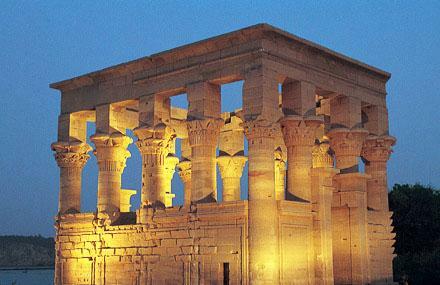 The famous Sound and Light Show at the Philae temple narrates the story of the legends of Goddess Isis & God Osiris. The narration digs deeper divulging interesting historical facts of the temple back in the days when the Philae temple remained flooded for about half a year and the reestablishment of the temple in 1960. During the restoration process, each stone of Philae temple was relocated. The temple is open daily. Summer: 07:00 pm, 08:15 pm and 09:30 pm. Winter: 06:30 pm, 07:45 pm, and 09:00 pm. You could take a taxi or rent a car to get to the temple. Love this? Explore the entire list of things to do in Aswan before you plan your trip. Fancy a good night's sleep after a tiring day? Check out where to stay in Aswan and book an accommodation of your choice. How popular is Sound And Light Show - Philaetemple Of Kom Ombo? People normally also visit Tombs Of The Nobles And Kubbet Al-hawa while planning their trip to Sound And Light Show - Philaetemple Of Kom Ombo. Beautiful temple. This one is moved and not so nice preserved as the temple of horus but you should definitely make a stop here. You go by boat to get to this island. Sadly a lot of plastic on the shore. For all those entry money they receive they should cleanup a bit more. An amazing temple with great history. It's a mix of Greek and egyptian history. Quite a sight to see right on the water. The columns will wow you and the temple will take away your breath. This is an absolute must if you're in Aswan.